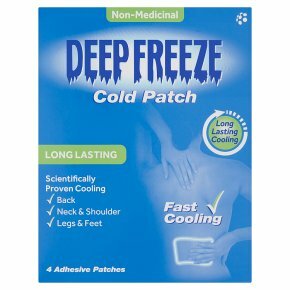 Drug-free, long lasting, adhesive patches providing targeted, cooling relief. Pain relief with cold therapy. Scientifically proven cooling relief for: joint, foot & muscle pain, muscular back pain in pregnancy, sprains & strains.Up to 12 hours pain relief* *Once removed, it can continue to provide pain relief for up to 9 hours. Scientifically Proven Cooling Relief. Works Like Ice by cooling the affected or swollen area. Dual Action Pain Relief The penetrating cooling action provides effective, soothing pain relief. Cold Therapy Cooling therapy can decrease blood flow to the affected area and may help minimise damage. Cold Therapy is recommended by physiotherapists for sharp, shooting pain, joint, foot and muscular pain, sprains and strains and minor sports injuries. Can also be used for pain associated with arthritis and muscular back pain in pregnancy. For Best Results: Apply the patch to the affected area as soon as possible. The cooling effect of the patch will be felt quickly and can last up to 3 hours. A new patch may be applied as required. Do not use more than 4 patches one after the other on the same area. Cooling therapy should continue until pain or swelling has reduced. See a doctor if your symptoms do not improve. Instructions for use Apply only to clean, dryskin Open the pouch, remove one cloth patch and peel off the clear plastic film Apply the sticky side of the patch over the affected or swollen area Do not cut the patch Re-seal the pouch to prevent remaining patches from drying out Use all patches within one month of opening the pouch Each patch can be used only once Throw away the patch after use. Warnings<br>For external use only<br>Do not use on broken or irritated skin or with other skin products on the same area<br>Do not use if you have an allergy to sticking plasters or menthol<br>Stop using the patch straight away if you get a rash, irritated skin or other unwanted effects<br>Do not use on or near the eyes<br>Do not use on infants or people who cannot remove the patch on their own<br>Use by young children should be supervised<br>If you are diabetic, have poor circulation or a skin condition, consult your doctor before use<br>If pregnant always check symptoms with your midwife<br>If your injury or pain is severe, seek medical advice before use<br>The patch can be used with pain medications taken by mouth however, do not apply the patch on top of medication rubbed into the skin.